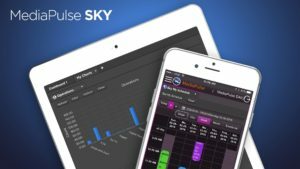 Chatsworth, CA April 18, 2017 – Xytech, creator of the industry-defining facility management platform MediaPulse, unveils MediaPulse Sky, a new mobile interface for MediaPulse, at the National Association of Broadcasters (NAB) this year. Additionally, over 400 new features are available to the innovative platform used by studios, networks, media companies and post facilities to power scheduling, asset managements, resource allotment, personnel, equipment, financials and more. MediaPulse Sky is not just a web portal. It’s a thoroughly reimaged interface for mobile devices. It is configurable through MediaPulse Layout Editor, so it is also a truly personalized experience. No matter what device users rely upon – phone or tablet – it is available with new dashboards and charts for Key Performance Indicators. Additionally, MediaPulse Sky is optimized for cellular networks. Users can actualize orders, confirm crewing assignments, provision video feeds, schedule sessions and review assignments wherever they may be with whatever device they choose. MediaPulse Transmission 2017 has a new, completely configurable operation screen with on-screen alerts and notifications. A new auto-routing feature allows users to quickly find the best routes between two points and leverages the MediaPulse Rules Engine to add user-defined criteria to the routing choices. MediaPulse Transmission offers enterprise-class operations and financial management tools specifically designed for the transmission environment, and the new features help to manage the complexities of circuits for the broadcast sector. Xytech has led the industry in automation for facility management software. At NAB 2017, they are demonstrating an automated camera-to-distribution workflow encapsulating metadata management, order management, transcoding and quality control, all performed with no users’ actions required. The Xytech team has also made a number of changes in the MediaPulse development platform. Now, MediaPulse offers the ability to integrate easily with any other system in the client ecosystem, enabling MediaPulse to act as a single console. Xytech is simplifying the complex operations of broadcasters and media facilities. Redefining the concept of facility management software, Xytech provides total control by integrating resource, order and asset management into one solution. MediaPulse, the company’s industry-leading platform, offers over 35 modules expertly crafted to handle the complicated tasks challenging every facility. With over 450 software deployments in more than 20 countries around the world, Xytech is the preeminent global provider of facility management software. The company has delivered innovative solutions to their media and broadcast customers for over 30 years and has headquarters in Chatsworth, California, with regional offices in New York and London.